Triple Eight has postponed the first full track test of its new ZB Commodore after the car sustained damage during a two-day aerodynamic test. Following a 60km shakedown at Norwell last Thursday, the team undertook straightline testing at Stanthorpe Airport in Queensland on Sunday and Monday with Kurt Kostecki at the wheel. Although the team says it achieved its targets at the test, the Stanthorpe runway proved brutal on the car, peppering the underside and panels with stones. Damage to key panels has led to the squad electing to postpone its first Accredited Manufacturer Test day, which was due to take place at Ipswich this Thursday. 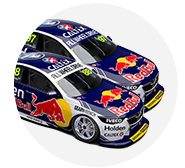 According to Triple Eight engineer David Cauchi, the ACM test will now take place after next month's Gold Coast 600. “The track temp at the airfield was quite hot and that meant that the sticky race tyres that we run on were ripping up some of the gravel on the tarmac of the runway and basically stone-blasted a lot of the panels on the car,” Cauchi explained on the team's website. “All the damage is cosmetic, nothing that we can’t repair, but with the tight turnaround it was already going to be a really big push to do this test and prepare properly for Bathurst. Despite the damage, Cauchi stressed that the team was encouraged by the aerodynamic numbers achieved at the test. The purpose of the running was to prepare the squad for December’s aerodynamic homologation testing. “The car is in a very good window of where we thought it would be, which is positive, and the changes we were making were matching the downforce numbers that we were predicting, so we feel like we have a good base car and a good bunch of tools to be able to tune the aero balance come the official Supercars aero test,” said Cauchi. “There are a lot of people who’ve worked very hard behind the scenes, as well as going racing, so it was extremely rewarding to see the car on track.